As people age, bone strength and muscle elasticity and tone tend to decrease. The lumbar discs begin to lose fluid and flexibility, which decreases their ability to cushion the vertebrae. If the spine becomes overly strained or compressed, a disc may rupture or bulge outward. This rupture may put pressure on one of the more than 50 nerves rooted to the spinal cord that control body movements and transmit signals from the body to the brain. When these nerve roots become compressed or irritated, lower back pain results. What Could Be Causing My Lower Back Pain? Common lower back conditions can present as numbness, tingling, or pain that radiates through either/both legs. Symptoms can vary greatly depending on conditions present and their severity. Numbness and Tingling usually indicate a more serious condition than pain. If you experience these symptoms, it is important that you seek immediate correction since further damage can result in the need for serious spinal surgery. Do you have any of these symptoms and think you may be suffering from a lower back condition? We have a quick and easy tool to help gather some information from you to help us determine what your problem is and get you on the road to recovery. 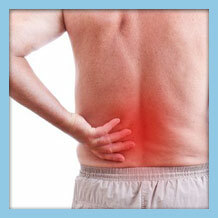 A variety of diagnostic methods are available to confirm the cause of low back pain. MRI’s, X-rays, Ultrasounds, and even visual examinations are effective at determining lower back pain conditions. Possible conditions include herniated discs, Osteoarthritis, Spondylolisthesis, Stenosis, or even a spinal fracture. OLSS provides a wide range of treatment options and because our doctors are the most experienced and best trained in treating spinal conditions we are able to perform many advanced treatments other practices are unable to offer. The real question is: What treatment is best to treat your lower back pain? Use our Treatment Match tool to quickly get started in finding the right treatment for you.